In 1711 a puppet play, Meido no Hikyaku ('The Courier for Hell - 冥途の飛脚), written by Chikamatsu Monzaemon I, was produced for the first time. It was based on a true story of a messenger named Chūbei who spent official money because of his infatuation with a courtesan. For this transgression he was executed. This play and many other versions based on this tale were adapted for the kabuki stage. The print in the Lyon Collection most likely commemorates a scene from one of these performances. "Chūbei is an adopted son whose family owns a courier service. He falls in love with Umekawa, a courtesan, and steals 300 ryō in order to buy out her contract and elope with her. At the end of the play, he is apprehended and led away to be executed." This is quoted from footnote 11 on page 70 in The Curious Casebook of Inspector Hanshichi: Detective Stories of Old Edo. 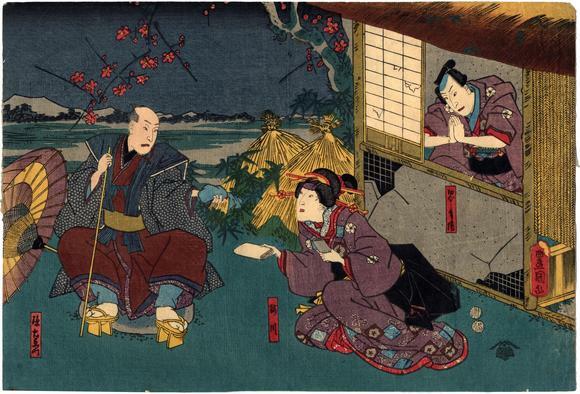 In this scene Magoemon, Chūbei's birth father, recognizes Umekawa and offers her money to help the hapless couple. Chūbei remains inside of the house of a friend of his so he won't be deterred from his flight by Magoemon. There was even a silent film from Japan based on this theme. It starred Onoe Matsunosuke. There seems to be some confusion about the date it was filmed. It was either 1916 or 1923. There are two copies of a Natori Shunsen double-portrait print of Chūbei and Umegawa, #s 937 and 1385, in the Lyon Collection.